When it comes to material selection for medical device plastic injection molding, it’s important to work with a molding company that’s been entrusted by the medical manufacturing industry to identify the best resin for a given device and who specializes in engineered resins. Below are the top 6 material considerations you and your plastic injection molding company should discuss before the resin selection process begins. Strength – When plastic injection molding medical devices, the strength of the device is a key consideration. The device must be designed to successfully function for its intended purpose, environment and service life. 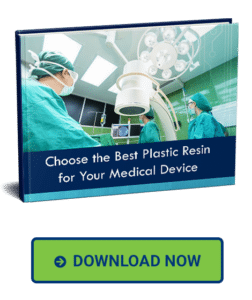 You need to make sure you’re using the best resin for the medical device, without overpaying for strength properties the device does not necessitate. Environment Conditions – The environment in which a medical device will be exposed must be accounted for during the resin selection process. Environment conditions may include temperature extremes, moisture, humidity, chemicals, bodily fluids, radiation, etc. Implantation or Direct Contact – If the medical device is intended to be implanted or if it will be in direct contact with bodily fluids, the plastic injection molding company must use a biocompatible resin that meets FDA regulations. Sterilization or Chemical Exposure – If the medical device is intended to receive sterilization treatment or will be exposed to chemicals the resin chosen must have chemical-resistant properties. One Time Use or Re-Use – Medical devices that are designed to be re-used typically require materials that have corrosion-resistant properties. However, one time use medical devices may not require materials with corrosion-resistant characteristics, which can potentially save on overall product development costs. Overmolding – If a medical device requires overmolding, the plastic injection molding company must ensure the materials are compatible so they bond well during overmolding, as well as maintain the bond for the designated service life of the device. PMC is a scientific plastic injection molding company that specializes in producing mission critical parts using engineered resins. We frequently serve the medical, aerospace/defense, filtration, food/beverage and electronics industries. Please note, we make components for medical devices – not end-use medical products. For more information regarding FDA requirements, please click here. PMC is recognized in the industry for solving complex molding challenges that other plastic injection molders can’t solve. We are able to specialize in this area of expertise because of our certified in-house Master Molders. Since so few plastic injection molding companies have certified in-house Master Molders, most are not able to solve molding challenges or create complex products. Contact PMC to discuss your project or securely send files for a quote.